"Oh, great." My first thoughts are not charitable. Someone is intruding on my evening, and Christ's unfortunate words come almost instantly to mind: "... as you did it to one of the least of these my brothers, you did it to me." In other words, I'm stuck. The man being presented to me is pretty much right out of central casting--unkempt and smelling strongly of tobacco and two weeks worth of body odor, with a large black pack full of his worldly possessions. Exactly the type you'd expect to find at a homeless shelter. But I'd arrived with simpler motives: our church is performing its occasional service to the needy, and I've dropped in to pitch in where I can. I fully intend to depart on time and unencumbered. Or I did. I hadn't figured on Homeless Don. A church member brings him to me (why does she hate me so?). He needs a ride, he says, because the shelter is out of beds for males. Naturally ... it's the added "no room at the inn" angle. And did I mention it's almost Christmas? You see, Homeless Don, the problem is you're off script! This is speed-ministry we're engaged in here. It's like speed-dating. No complications, no commitments. We're like two ships that pass in the night. I'm not interested in stopping to pick up lifeboats. Your job is to eat, drink and be merry, for tomorrow I go back to work. Of course I've blogged about this very scenario. Keith Green even made a cameo. What on earth am I going to do with Homeless Don? Can I take him home? The usual nightmare scenarios jump to mind. Fortunately, I have a convenient excuse ... we currently have other houseguests. 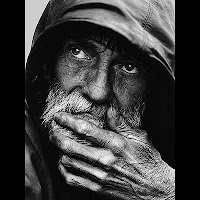 I can't very well foist Homeless Don upon my guests, can I? My inn is full too. Right? Nor can I simply turn my back on him. More Scripture leaps to mind unbidden: "But if anyone has the world's goods and sees his brother in need, yet closes his heart against him, how does God's love abide in him?" Okay, right ... I get it. But what am I going to DO with him? Lacking a clear plan, we get in the truck--Jailer Jr. riding shotgun and Homeless Don in the back seat. He wants a ride downtown so he can wander the streets and look for a place to sleep. Yeah, so I can't very well drop him off at the train station. I'm pretty sure that's not on the list of acceptable options. "Do not neglect to show hospitality to strangers, for thereby some have entertained angels unawares." So, God, I left your angel at the train station. Can you send someone to pick him up? Maybe I'll put him up in a motel. Yes, that's it. One night. He can take a shower and come back to the shelter tomorrow. It's clean, and relatively cheap. It's non-committal. It's weak. Sigh. What will I do with you, Homeless Don? Lacking a plan, I talk to the man. What? He has family in the area? At least 2 brothers ... well, there's a third but he thinks he wouldn't be happy to see him. Will any of them be happy to see Homeless Don? I sure hope so. I imagine the alternative scenarios and they don't end well. Homeless Don doesn't remember where they live exactly. He hasn't seen them in ages, but he has an unusual last name. Out comes the smartphone. Hope, thy name is whitepages.com! We get a lead on Brother Dave, but when we arrive at the house he has moved away. The euphoria begins to wane ... the sick feeling returns. It all rides on Brother Tom now. As we approach our second destination, Homeless Don apologizes again for the trouble. I ask him if he's ever read the New Testament. He hasn't. I tell him about Matthew 25 and "the least of my brothers". He promises to read his Bible. Maybe he will. The trailer park is dark and the house numbers are hard to make out, but eventually we find the place. I leave Homeless Don in the truck while I knock on the door. A voice from inside ... "Yeah?" Not sure if that translates to "Come in", I repeat the sequence. Finally, I ease the storm door open and see a man, a woman and two kids. "Do you have a brother named Don?" "Well, I think I have him in the truck." The woman speaks for the first time: "Donnie?" She turns out to be his aunt. She doesn't sound angry, terrified or ambivalent. She sounds, dare I say ... happy? It's a beautiful sound. Explanations, reunion, relief. Homeless Don is now just Don. He will not spend another December night on the streets of Fredericksburg, but will have a Merry Christmas with his family. God's lesson to the Jailer household: Trust and obey. I've got this. Just get in the truck, talk to the man, and watch what I do. When we encounter panhandlers, it tends to be a lot easier to turn away: The two dollars for which he asks would probably just go for drink. So we can tell ourselves that we wouldn't really be helping. On top of that, at least if one lives near Santa Cruz, one sees so many behaving obnoxiously that it's much less tempting to respond with sympathy than it is to respond with indignation, stop shopping there, and go to Capitola instead, where they don't put up with that. So you really stuck your chin out, going in Christ's name to a venue where you had to encounter Don as a fellow human being. It's a blessing that the Lord leads us into that sort of situation.